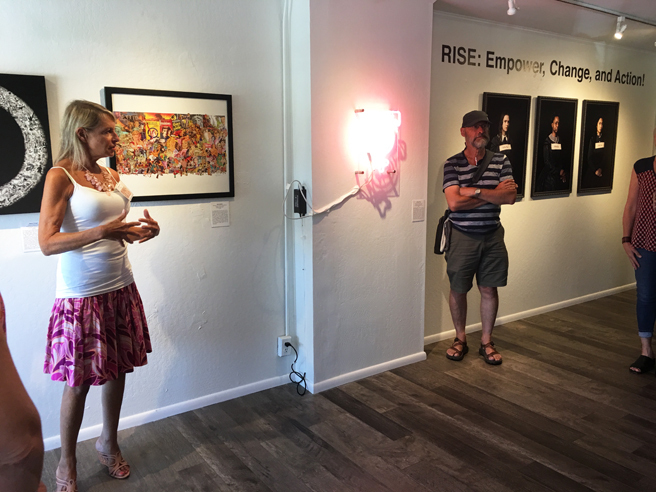 The Gutfrend Cornett Art exhibition, RISE! 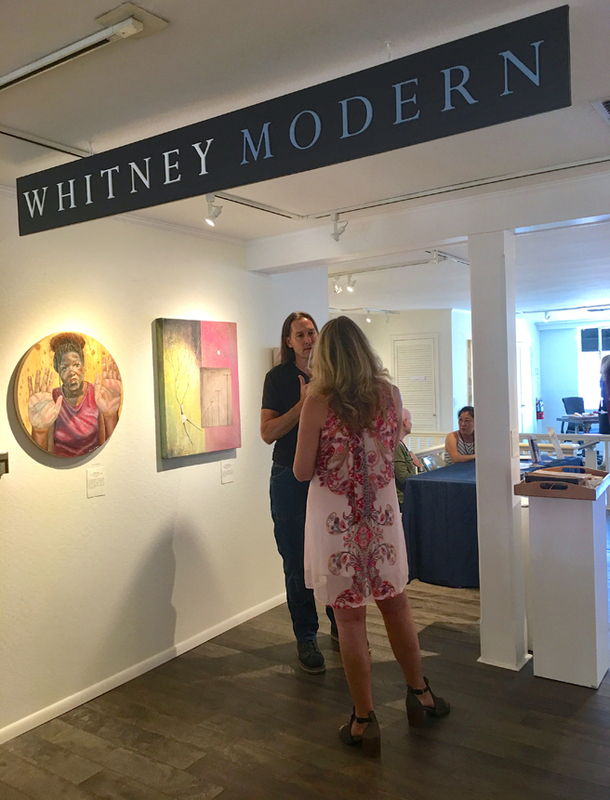 Empower, Change and Action Reception and Artist Talk and Walk at Whitney Modern in Los Gatos, California last Saturday was completely uplifting and inspiring with artists as far away as New York sharing the moving inspiration and fascinating stories behind their work.The exhibition is intended to create a dialogue between artist and community together over important issues feminist issues of out time. 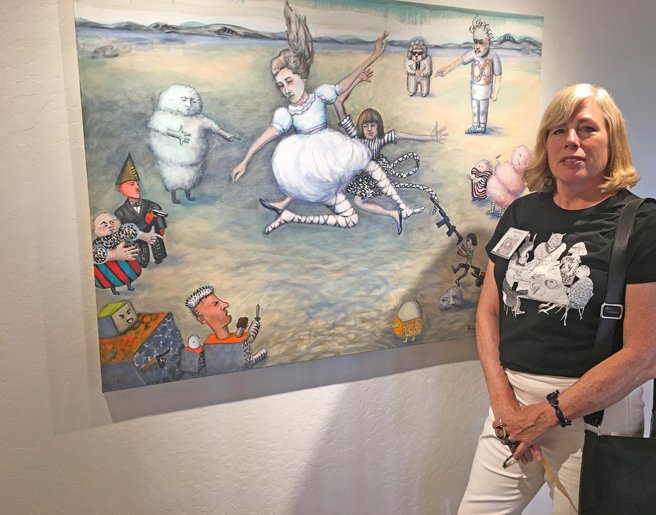 Click on artists names for links to their websites where available. 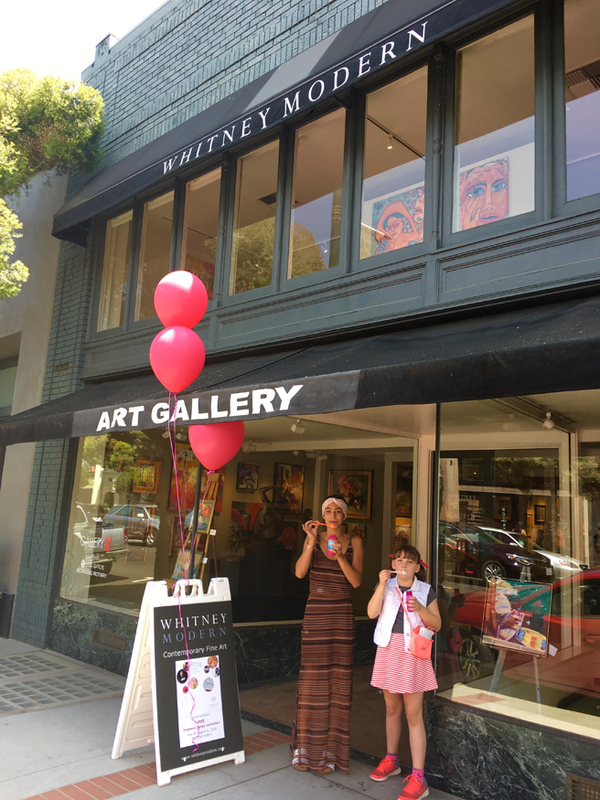 The girl blowing bubbles on the cover of the exhibition catalogue came to life welcoming quests to the reception. 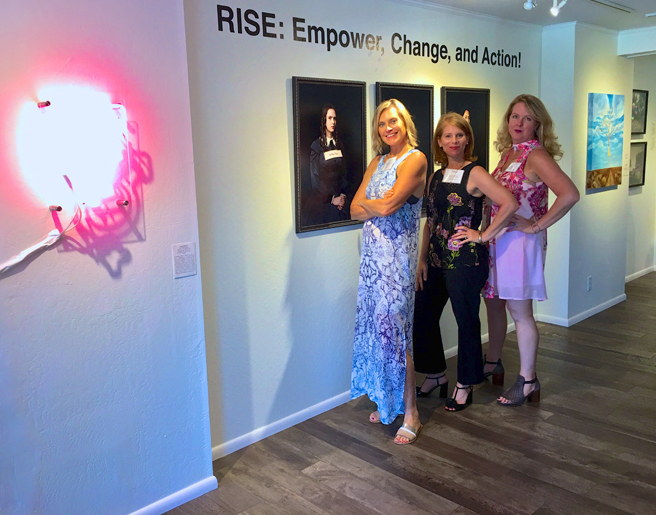 Three of the four fabulous curators, Suzanne Whitney-Smedt, (Gallerist of Whitney Modern) Marianne McGrath (Independant Curator), Karen Gutfreund (Activist Curator at Gutfreund Cornett Art and Arist) that pulled together this fabulous exhibition, standing in front of Vanessa Filley‘s (Evanston, Illinois) archival pigment print on cotton rag paper pieces, #Me Too, Minerva Looking, #Me Too, Assata Toward, #Me Too, Gabriela, The Futrure and bedside Indira Cesarine‘s (New York, New York) neon piece, Equal Means Equal. 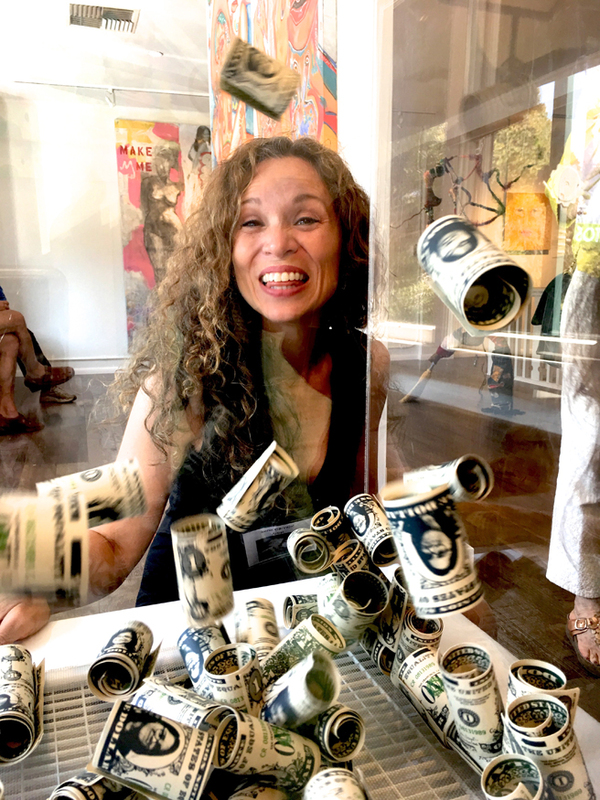 The fourth fabulous curator, Sherri Cornett (Activist Curator at Gutfreund Cornett Art and Artist), was unable to make the reception, and was greatly missed! 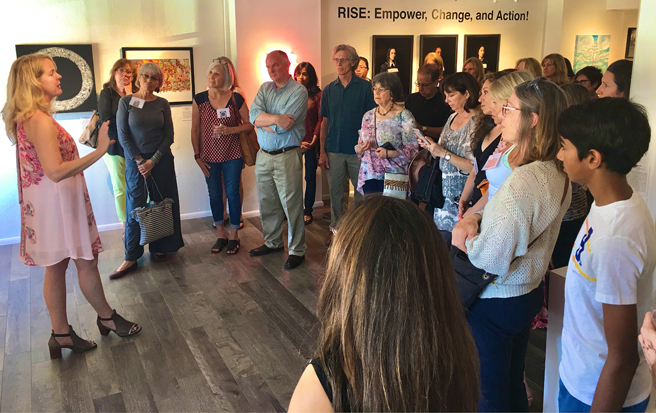 Karen Gutfreund, engaging the audience, earlier she had read Maya Angelous’s poem, Still I Rise, in honor of Ceciley Blanchard (Jackson Tennessee) who had based her photographic series, (included in the catalogue) on this poem and was unable to make the reception where she had hoped to recite the poem herself. Love how the In a Constant State of Rising and Falling installation floats in the “atrium” between Whitney Modern above and Gallery 24 below. 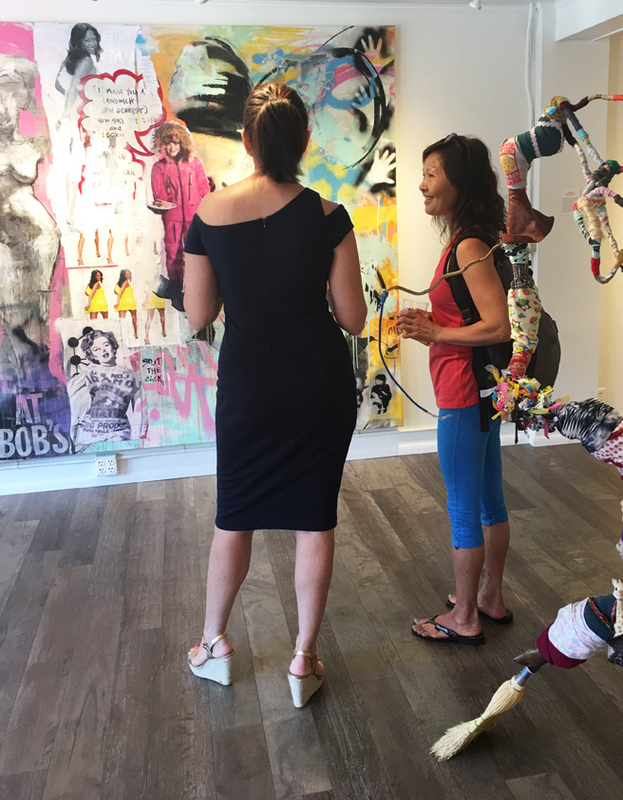 Artist Walk and Talk around the gallery where each artist would speak briefly about their contribution to the show. 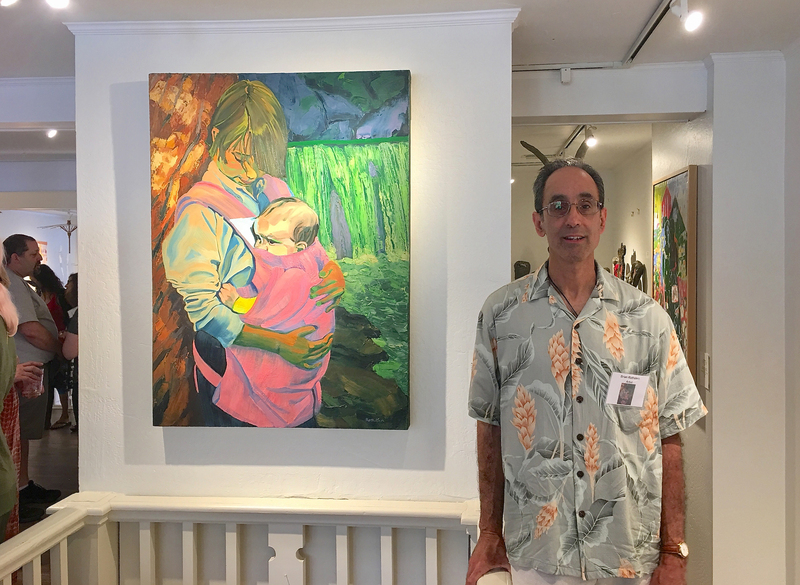 Me with my oil on panel painting, In the Pink. 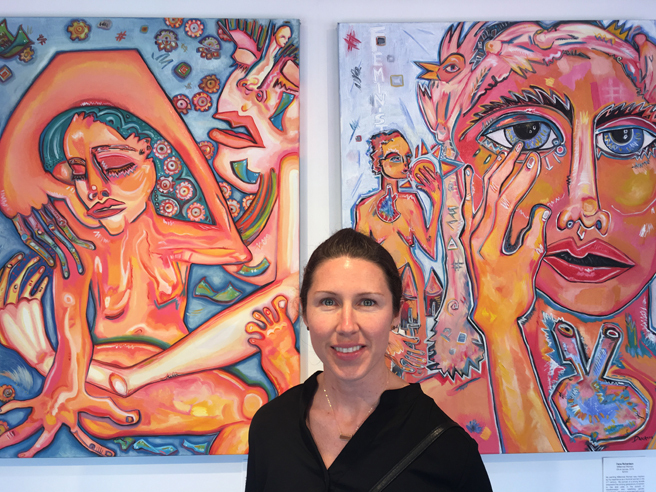 Dana Richardson (Scotts Valley, California) with her oil paintings Burning Woman and Millennial Woman. 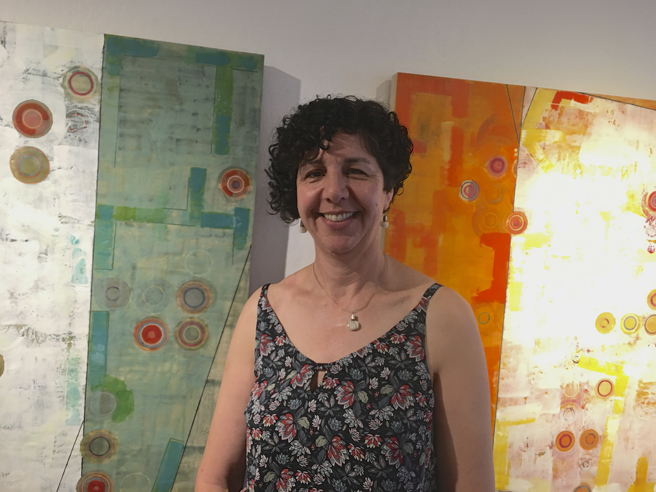 Maeve Grogan (Bend, Oregon) with her Mixed Media and Flashe acrylic painting, Noise & Space Game. 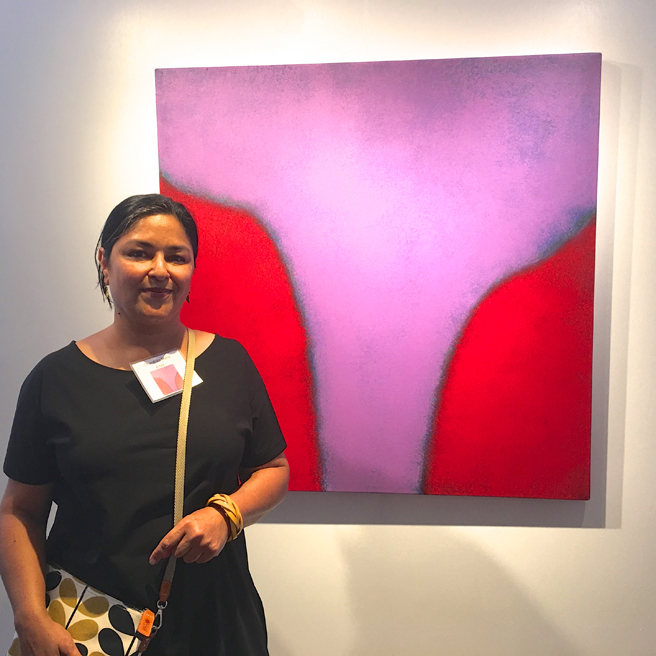 Mague Calanche (San Francisco, California) with her acrylic, oil and wax on wood painting, Todas Trabajamos, Hasta Las Ninas. 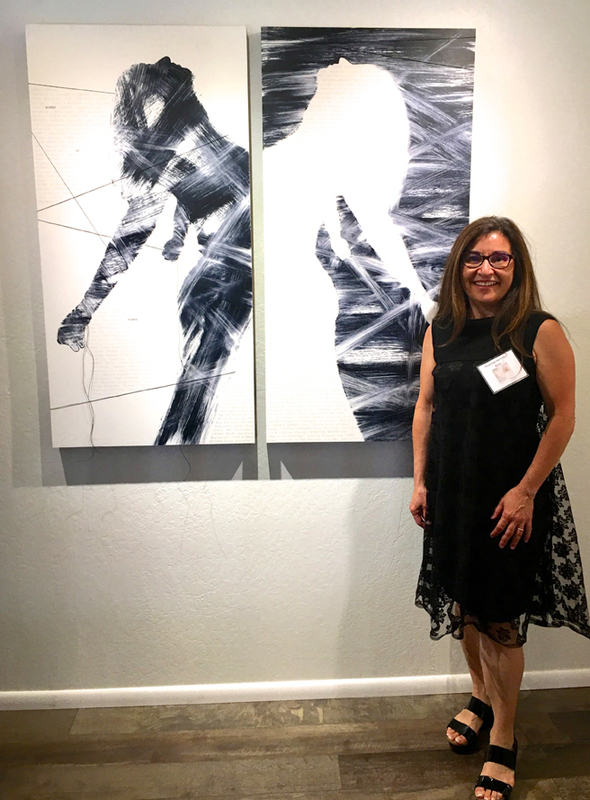 Rozanne Hermelyn Di Silvestro (Sunnyvale, California) with her monotype, oil, paper and string on panel piece, Bound. 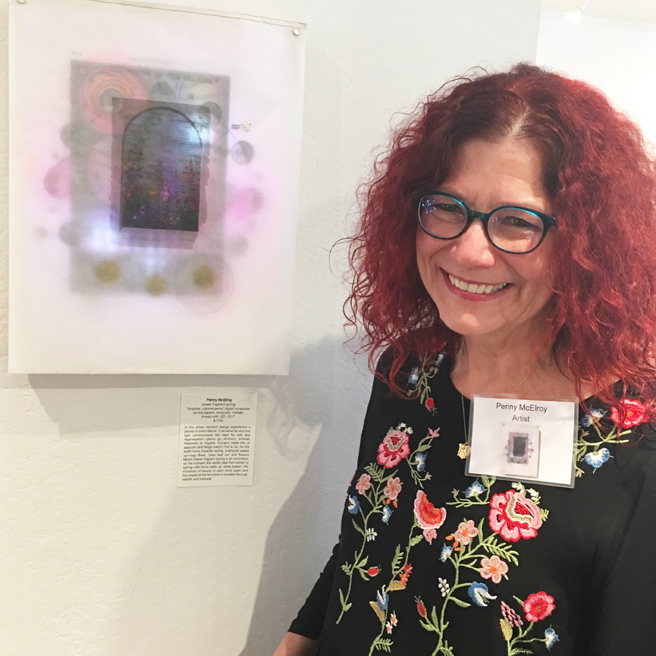 Penny McElroy (Redlands, California) with her graphite, colored pencil, digital composite, encaustic, metal thread with LED piece, sweet fragrant spring. 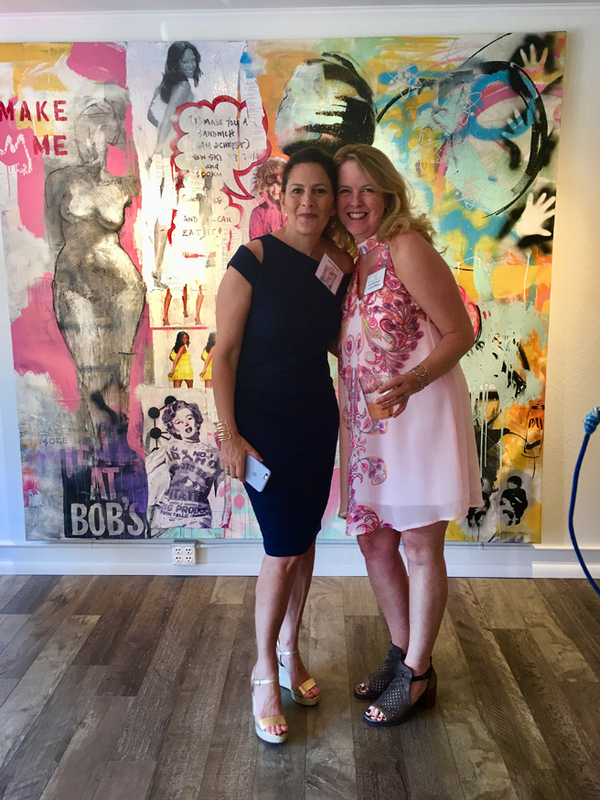 Jenny Reinhardt (Summit, New Jersey) with her mixed media on canvas painting Split the Sack and Karen Gutfruend. 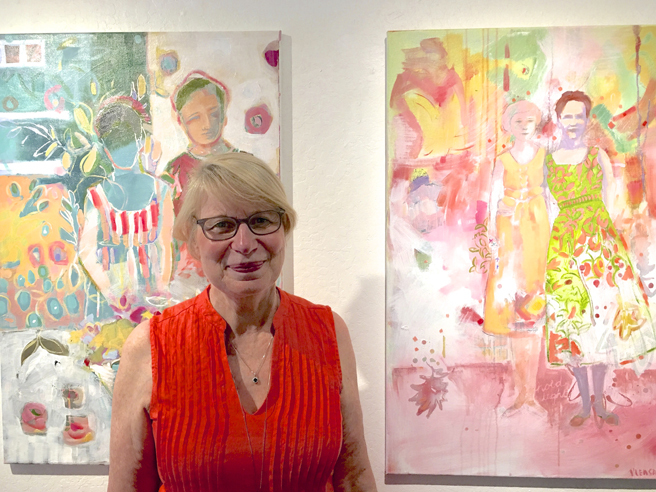 Amy Pleasant (Mill Creek, Washington) with her acrylic painitngs, Something Worth Waiting For and On Her Shoulders. 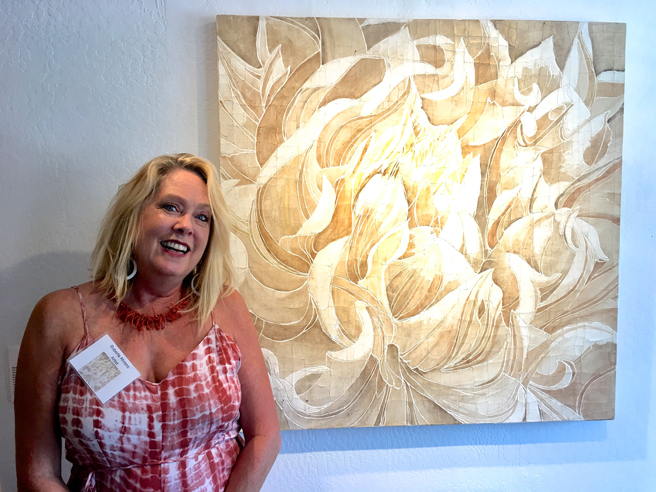 Chandrika Marla (Mountain Vew, California) with her acrylic on canvas painting, For Our Lives. 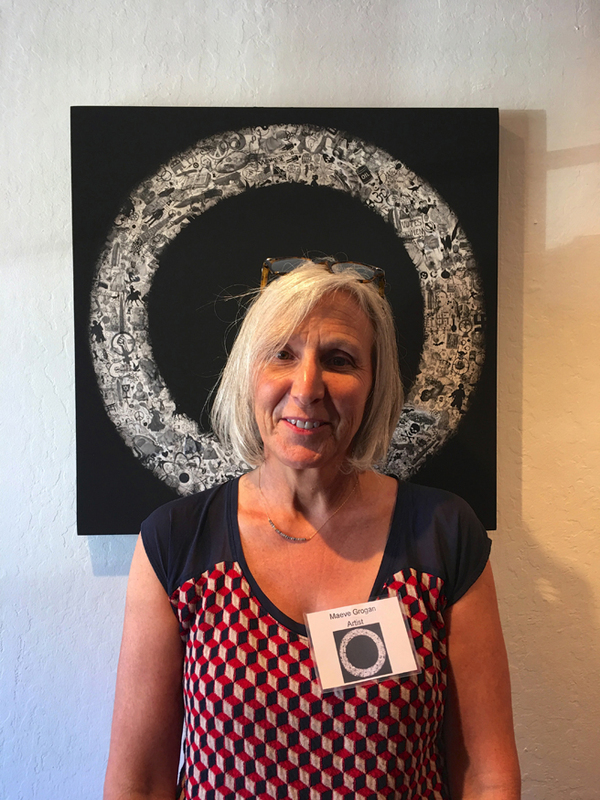 Karuna Gutowski (Santa Cruz, California) with her acrylic, mixed media and image transfer, Ambient Thoughts. 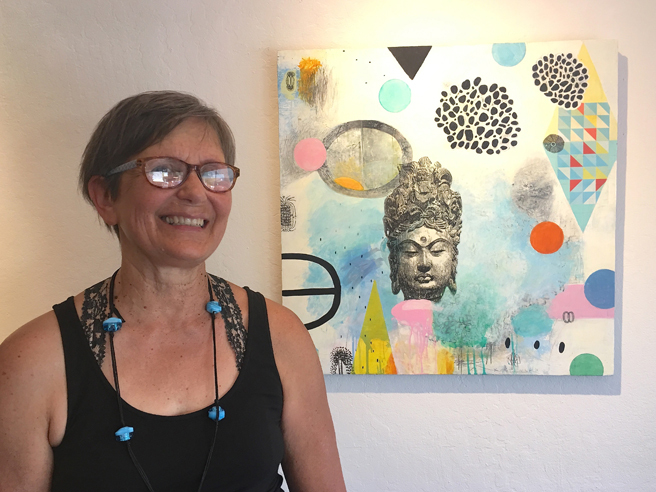 Paula Bullwinkel (Bend Oregon) with her oil on canvas painting, So The Darkness Shall Be The Light And The Stillness The Dancing. 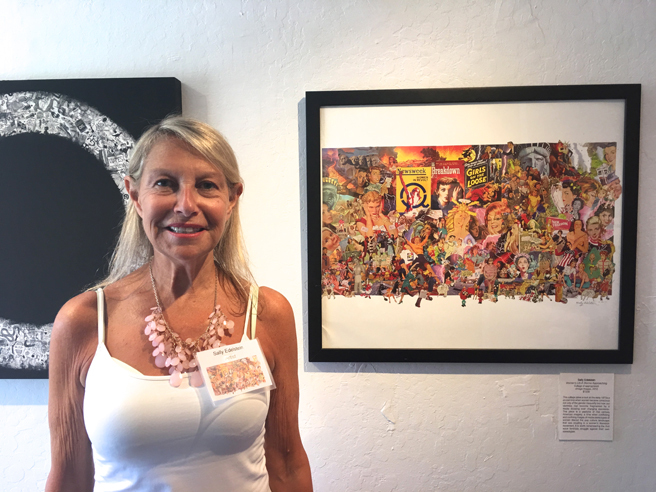 Sally Edelstein (South Huntington, New York) with a print of her monumental collage, Women’s Lib-A Storms Approaching. 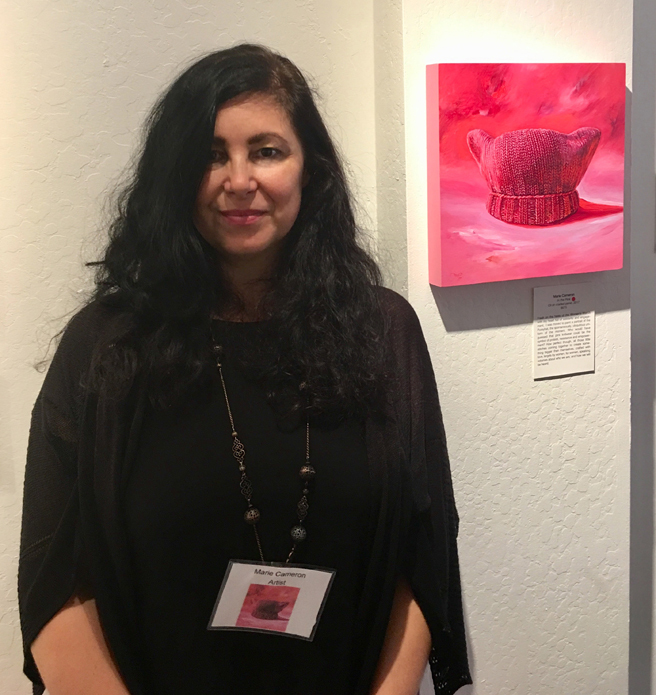 Roberta Aherns (Petaluma, California) with her plaster embedded fiber and acrylic painting on box frame painting, Sepia Dahlia. 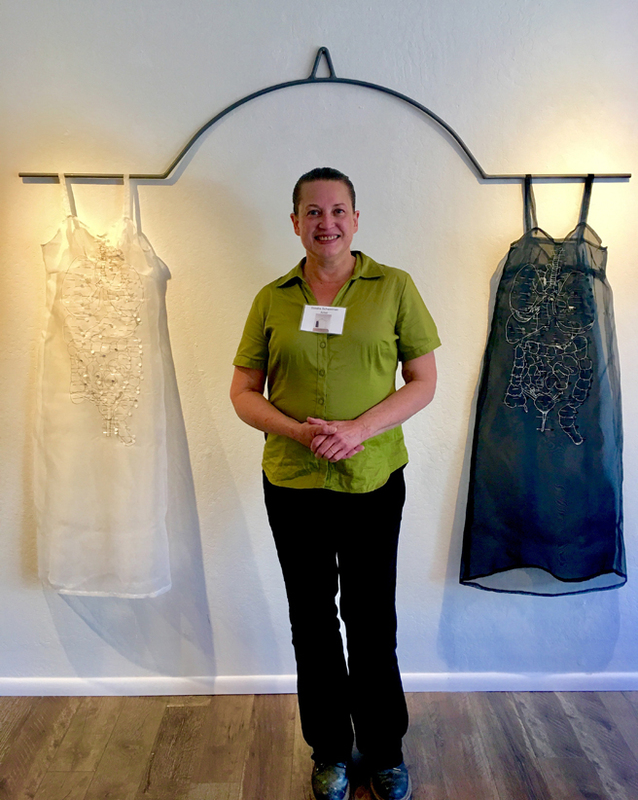 Sondra Schwetman (Arcata, California) with her silk, pigmented sewing pins and steel sculpture, Witness. 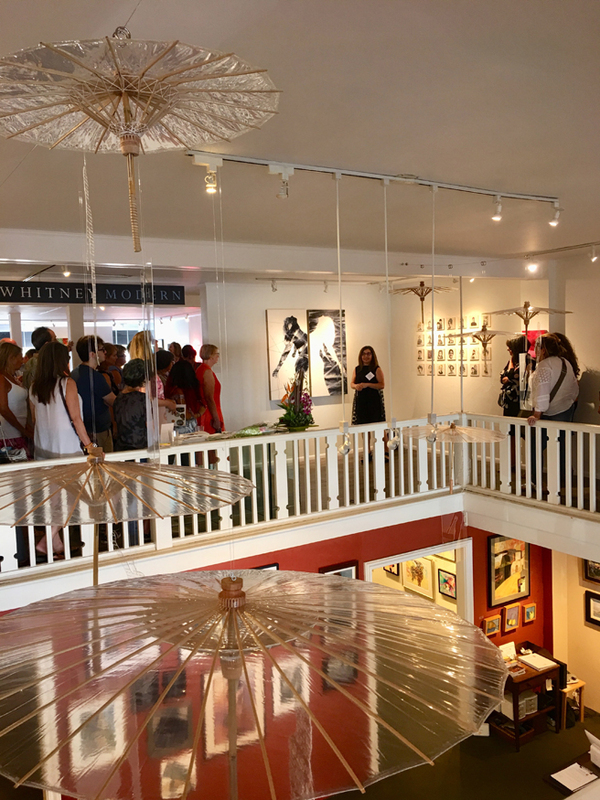 This piece was a Special Award Winner by guest juror, Joan McLoughlin of Mcloughlin Gallery in San Francisco! 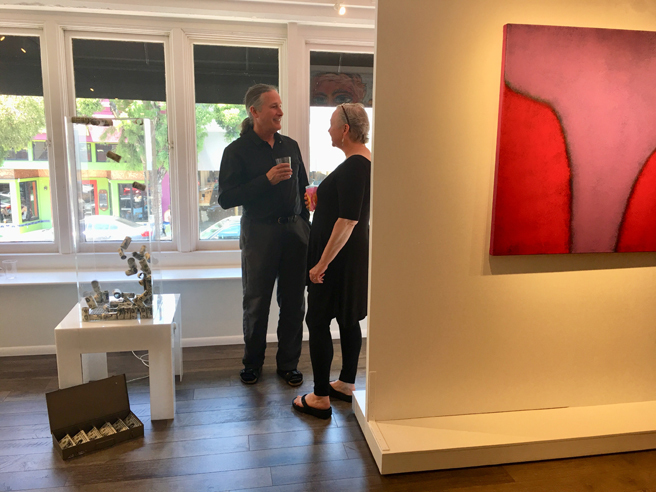 Brian Rothstein (Vallejo, California) with his oil painting on canvas, Be Gentle 1. 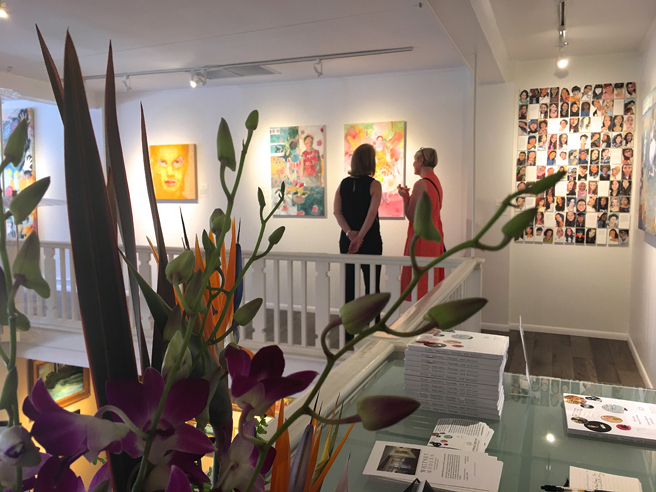 On the far left of this photo is the monitor displaying even more amazing work that is included in the catalogue but for which gallery space would not accommodate. 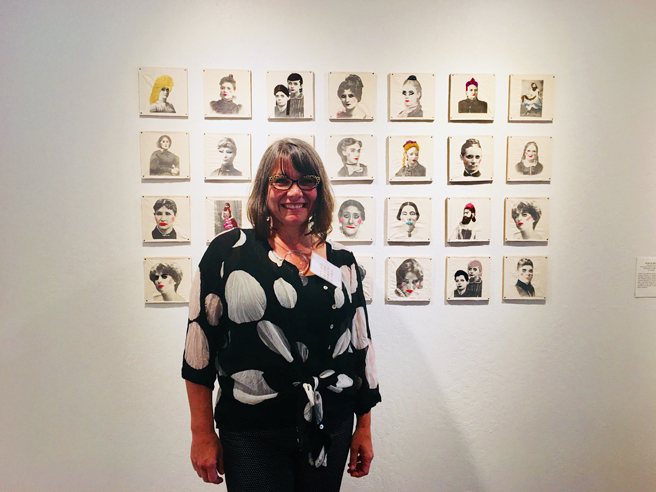 On the right is Marisa Govin‘s (Talent, Oregon) watercolor on paper painting, Ñust’as. Pages from Gloria Matuszewski ( Novato, California) mixed media, Altered Book, Gray’s Anatomy. 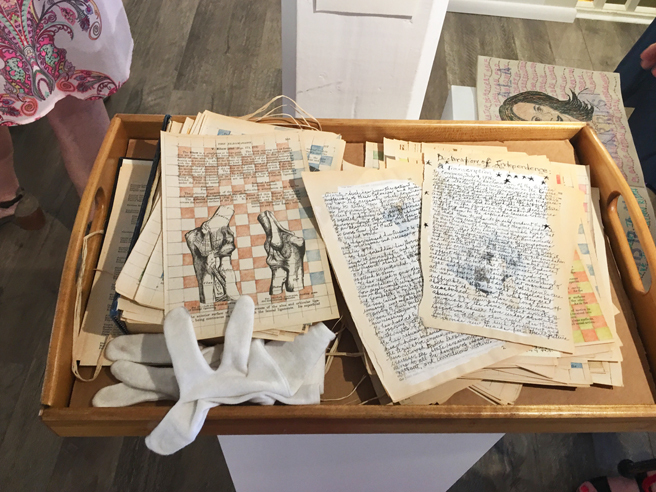 Gina Herrera‘s (Bakersfield, California) assorted found materials sculpture, Jaunting for Restitution. 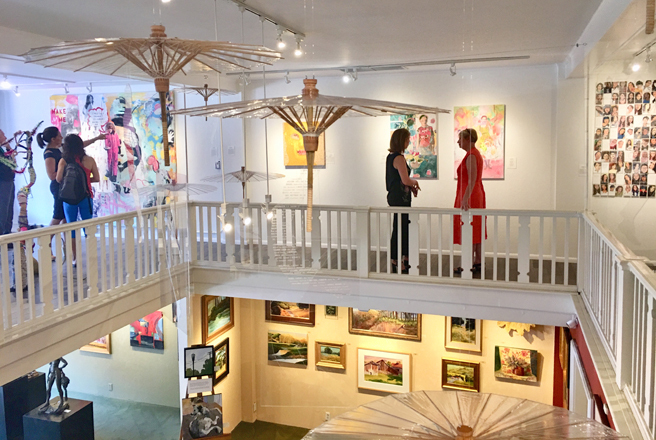 Rozanne Hermelyn Di Silvestro (Sunnyvale, California) upstaged by her clear umbrellas, fishing line, silkscreen or laser cut plexi installation, In a Constant State of Rising and Falling. 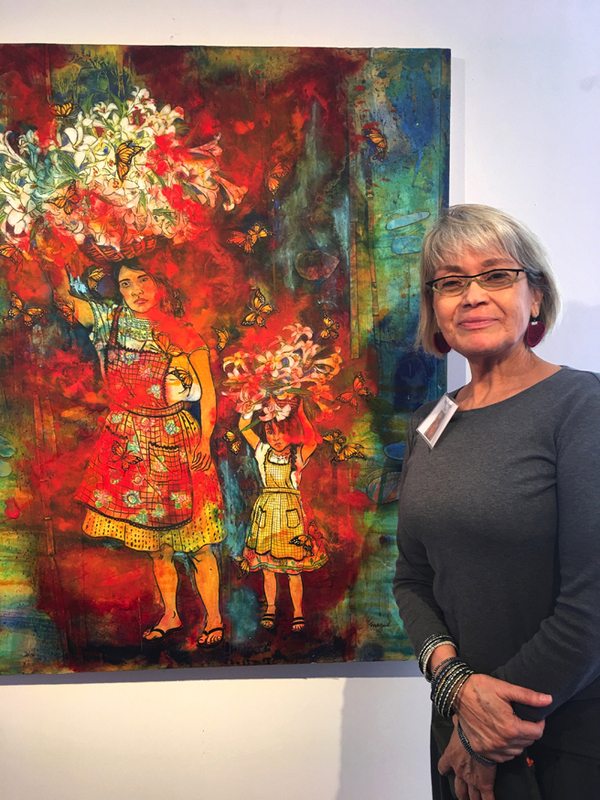 Viewing Nayda Cuevas (Arlington Massachusetts), oil and panel paintings #latina:Reclaimingthelatinatag. 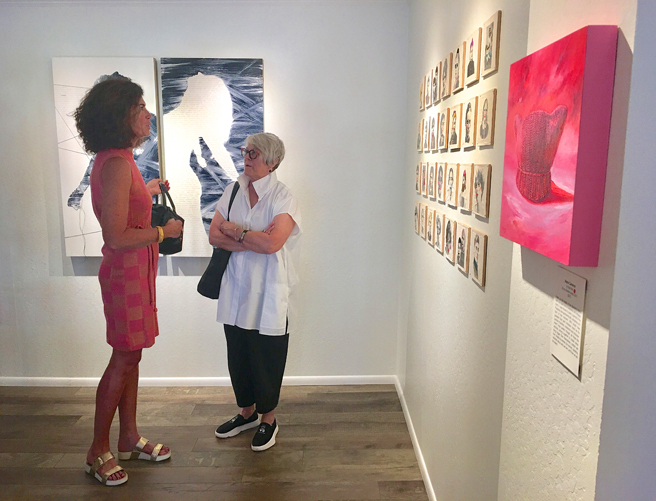 Anitra Frasier (Dolton, Illinois) was a Special Award Winner chosen by guest juror Jessica Porter (Arts Bussiness Strategest, New York, New York) for her oil on wood painitng, I Think It’s Going To Rain Today, on the left. 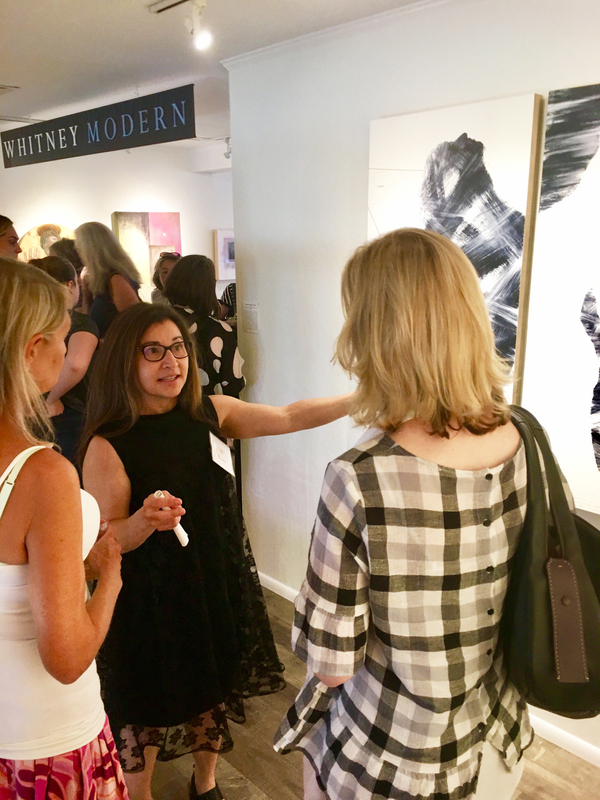 On the right is Kelsey McDonnell’s (Buffalo, Wyoming) acrylic on canvas painting, Learning to be a Phenomenal Woman, #6 Balancing Time and Energy who was also chosen as a Special Award Winner by guest juror, David Weinberg, (Executive Director of Weinberg Newton Gallery, Chicago Illinois) for her acrylic on canvas painting, No Turning Back. 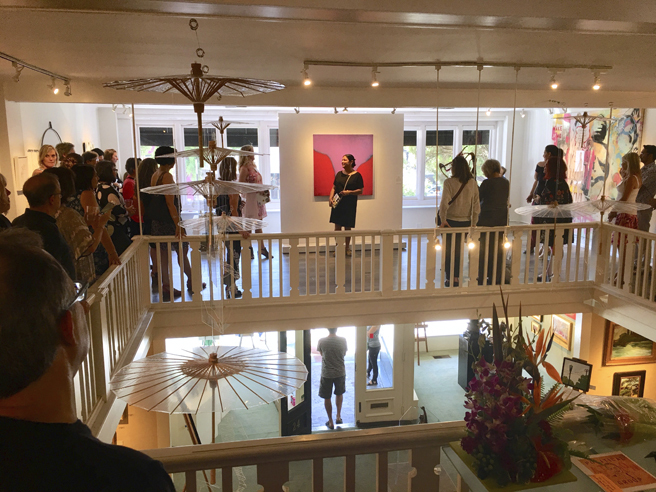 Sally Edelstein speaking on her work. 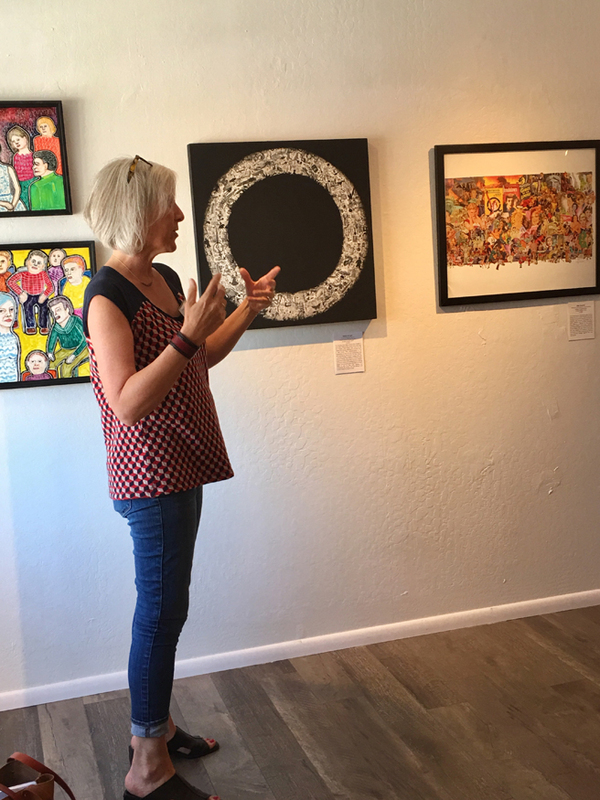 Maeve Grogan describing the meaning behind her work. 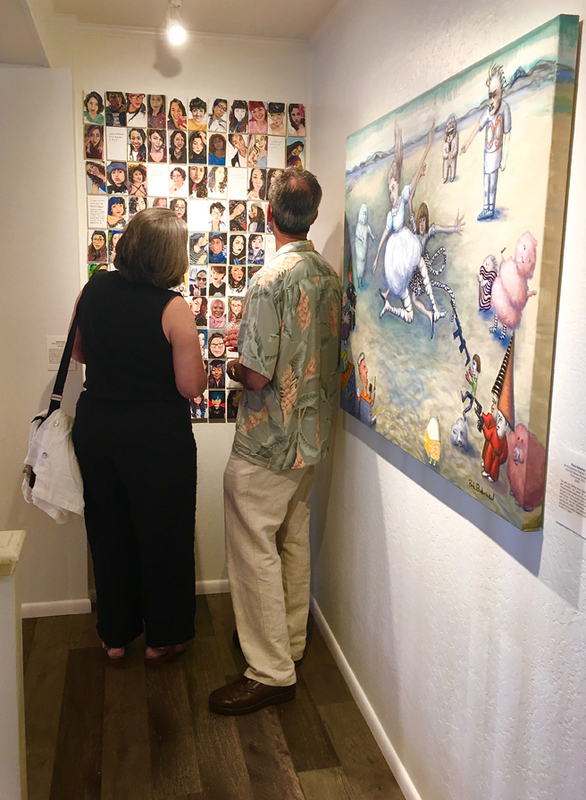 A glimpse of Beth Lakamp’s (Fenton Missouri) watercolor on clayboard panel, that’s the idea and she told them so. 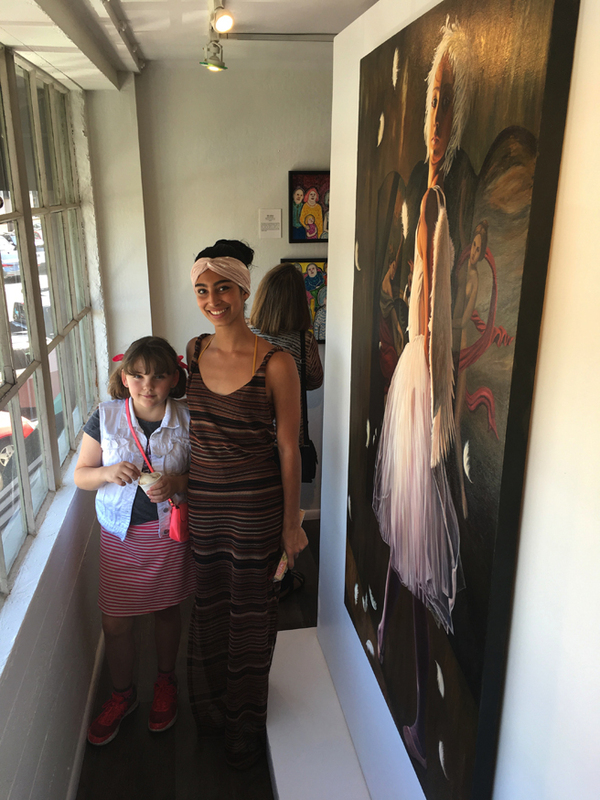 And my favorite photo from the reception, my muse for my oil painting, Feathers hanging with my favorite bubble girl! 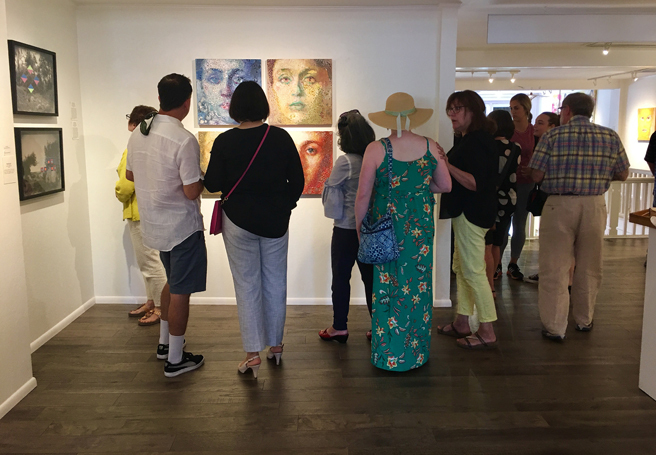 A distant peek at Sarupa Sidaarth‘s (Tiburon, California) acrylic, googly eyes, eyelets on canvas painting, Shh. 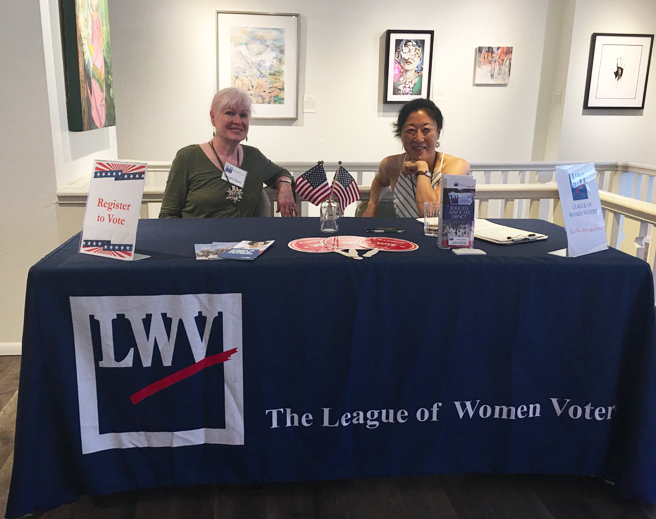 The League of Women Voters, a non partisan group, had volunteers available at the gallery to register people to vote. 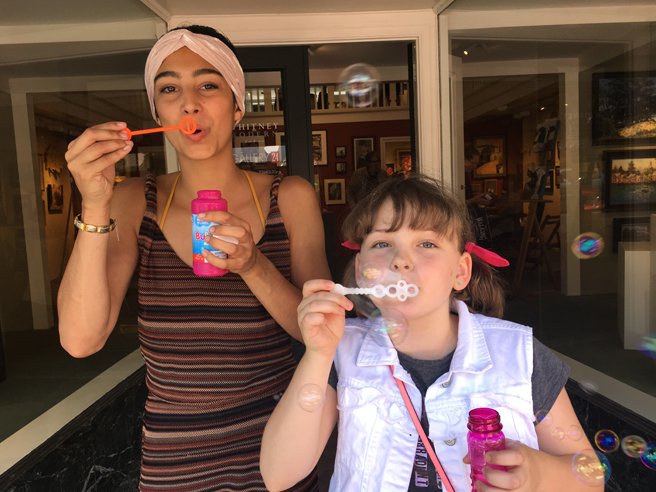 Make your voice heard and Vote! 46.9% of those eligible did not vote in 2016 and look where that got us! 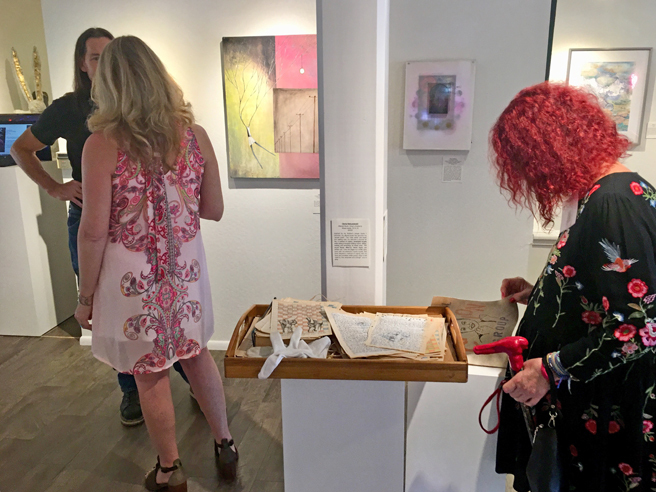 in the background you can catch a glimpse of Blond Jenny‘s ( Edison New Jersey) c-print, Womanhood, Lindsey Carrell‘s ( Billings, Montana) oil and egg tempera on panel painting, Translate, and Shelly Floyd‘s (Round Rock, Texas) acrylic on paper painting, Struggle to Rise.